'March against evictions' 19 September 2015 (Peter Marshall/Demotix)At the time of writing, the shadow of yet another block of luxury flats looms over me in Tottenham. The noise and mess associated with house building seems to be an almost permanent fixture in London, but how many of us have a secure home to live in? The UK government does not keep central statistics on homelessness for various reasons, including the fact that homelessness is recorded in different ways across the different nations. Figures nevertheless show that in 2014, there were 1.37 million households waiting for a home, up 26% from 2000. In England, there are 64,710 households living in temporary accommodation – an 11% rise on last year’s figure and up 26% since 2010. Among those numbers are 93,320 children. 7,500 people were recorded as sleeping on the streets of London last year. The real number is undoubtedly much higher. London’s housing crisis affects everyone who is not a millionaire, from young professionals trying to get on the housing ladder to hotel workers forced to live in sheds by slum landlords. But on Saturday 12th September 2015, some saw a glimmer of hope in the election of Jeremy Corbyn MP as leader of Her Majesty’s Official Opposition. In his first speech as leader of the Labour Party, using powerful words, Corbyn committed to work with Sadiq Khan, Labour’s mayoral candidate to end the ‘social cleansing’ associated with the housing crisis. "I am fed up with the social cleansing of London by this Tory government and its policies," Corbyn said. Housing is both personal and political for me, so I take very seriously anyone that claims to have the potential to end the current crisis. My family were made homeless when I was 14, after my mum was forced to flee domestic violence. Over the course of a year we were placed in over ten different bed and breakfasts. At one point I was traveling from South End to my school in East London before we were finally allocated a council flat. This was at the beginning of the crisis, when homeless families could still expect to be housed, in council housing, within a year. Despite the turmoil we went through to get a safe, secure home, the current government's housing policy now means that the council is desperate to get its hands on my mother’s home. Benefit sanctions and the bedroom tax result in rent arrears that lead to almost immediate threats of eviction. My mother’s life is an almost constant battle to keep her head above water and a roof over her head; the same is true for millions of working class people across the UK. Corbyn has put forward an alternative to the 30 years of housing policy that has sought to put our housing needs, unchecked, in the hands of private landlords. He pledges to lift the housing revenue account cap to allow councils to build council housing. He wants longer tenancies, private landlord registration, rent regulation and private rents linked to average local earnings. “It has become clear that when housing provision is left purely to market forces most of our young people simply cannot afford to get a foot on the rung of the market’s so called housing ladder” he has rightly observed. Not only is the lack of housing putting women’s lives at risk, the allocation of what is available needs addressing as a priority, Lucy explains. “Single women fleeing domestic violence have no right to support from housing by the government whatsoever. Thousands of migrant women are forced to remain in violent homes, unable to flee because racist ‘no recourse to public funds’ laws prevent them from accessing any benefits or public housing”. Shanice McBean from the militant black activist group, Black Dissidents also wonders what Corbyn’s policies are regarding extending the right to benefits and council housing to all migrants. However, she notes that generally speaking, Corbyn’s policies are establishing the principle that home and community should be for people, not for profit. “At a time when black and brown communities are being gutted and redevelopment projects led by slum landlords and for-profit housing businesses are making our own communities unaffordable for us to live in, Corybyn’s polices are moving in the right direction” says Shanice. It feels that for those who have been fighting for a more just housing system in a climate of neo-liberal dominance, Corbyn’s calls for fairness are mostly welcome. But for me, the real question is not whether his policies are good ones or bad ones, but how seriously we should take him as someone who can deliver. Over the last year or two, significant gains have been made by grassroots, local housing campaigns such as Focus E15 and Sweets Way resists. But the victories made locally are yet to be translated into a solid, national housing movement that has influence over national policy. Indeed, one of the reasons Corbyn’s victory has been so well received by the left is that we had, until then, felt depressingly weak and fractured as a movement. And while the labour leadership’s move to the left has indicated we may be more substantial than we thought, our fundamental strength and influence remains questionable. For one thing, many of the local housing campaigns fighting for justice are doing so in Labour run councils. Is Corbyn likely to be in a position to influence local government without the dynamic of a strong and robust social housing movement pulling him and the rest of the Labour Party to the left? It seems unlikely. The broad left movement appears to be in a catch 22 dilemma. We feel too weak to dismiss him out of hand as someone with potential influence, yet some on the left are questioning whether the wider left could have a meaningful relationship with Corbyn under the current circumstances. If that is the case, how much should we as a movement invest in building links with the Labour leader? As someone who so robustly presents himself as an ally, it would seem churlish and imprudent to completely exclude Corbyn from the conversation on how we achieve housing justice in the UK. However, might we be in danger of devoting too much energy to a relationship that is unlikely to reap the rewards we want without the solid foundation of a national, radical movement in place? Social cleansing can only be fought with a social movement to guide policy. 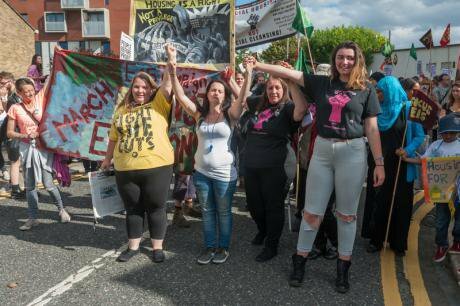 As hundreds marched through the streets of Stratford this weekend to mark two years of the Focus E15 housing justice movement, campaigner Jasmin Stone observed that 26 families are being evicted every day across the country. “Homes are for people, not for investors” read the signs. Corbyn’s election is a time for guarded hope but not for a change of tactics. It’s more important than ever to understand the human dimension of these statistics. See you on the streets.